Unlike graphene, graphene-oxide (GO) has a bandgap, but has poor electronic properties (due to disorganized arrangement of atoms). 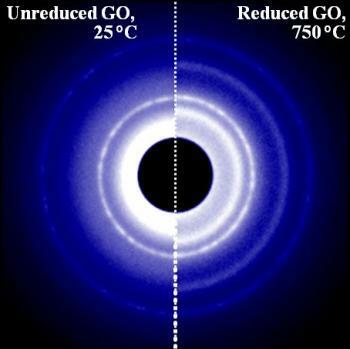 Now researchers from the University of Wisconsin—Milwaukee have developed a method to make ordered GO. They hope that this method will enable "ideal bandgap" carbon based devices to be used as transistors, sensors and optoelectronic devices. The researchers made a device made from layers of oxygen-poor graphene sandwiched between layers of GO, and then annealed (heated) it. The resulting device (shown on the right of the image above) has a more complex and ordered structure (you can see this as the extra rings in the image).